Isn’t that a travesty? Why would you not put more resources toward solar power instead?? Beautiful photo by Mr. T.
A travesty indeed Ardy. Makes me feel hopping mad and quite helpless. A truly criminal act on the part of our government IMHO, guilty of nepotism, enviromental abuse and greed. Australians in the future will rue the day they gave this government power!!!! My little rant shouldn’t distract from the beauty of the sea grass captured by Mr T.
I’m happy for your rant and hope that more readers might do the same. Every day, we are confronted by more outrageous acts of stupidity by this small minded and ignorant lot. 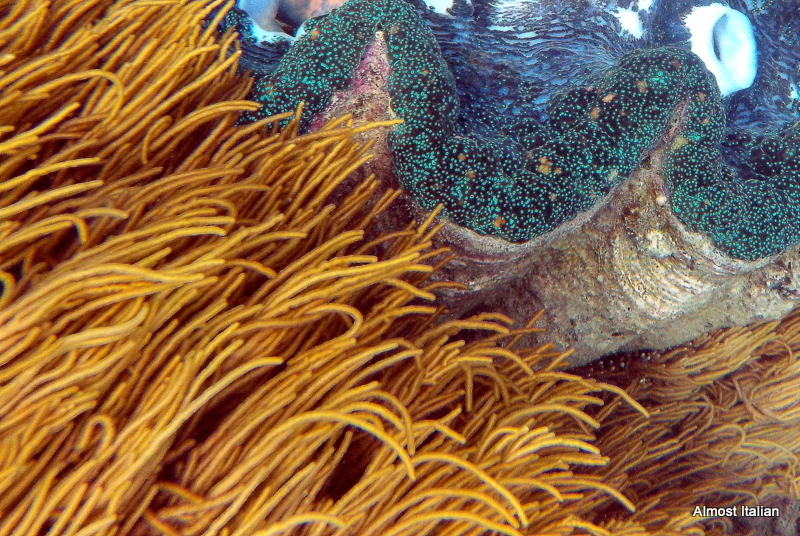 Mr T loves his underwater camera, but amongst his many gorgeous shots, there were many of broken and faded coral too. Yes, that just about sums it up. Lets dump a whole lot of coal tailings in the sea- Oh and let’s forget that Gladstone and Townesville have 320 days of sun per year and yet not invest in solar energy up that way, or anywhere else. Yes, Australia- the laughing stock of the world because it is so backward! So true, the shortsightedness is mind boggling. Lovely pic Fran. I am more disillusioned with substantial ignorance that is ubiquitous within the Australian general public. This government is milking it to its full extent. I am glad Mr T got the underwater camera he liked. The government, its policies and the general public who seem to accept these monstrous and backward leaps, make me angry and quite sad. Unfortunately, strong leadership in the opposition camps is also lacking. Meanwhile the Murdoch press holds sway and dishes up its daily dose of ignorance. Beautiful photo that highlights the contrast between Australia’s environmental/ecological best interests, and the commercial Australia For Sale interests that go almost unchecked except for the farsighted people who are yet still deemed unfashionable out of touch with commercial reality greenies behind the smokescreen of no brainer domestic policy and political personality squabbles. Big sigh here. Big sigh from here too. Aargh! Shortsightedness and anything for a quick buck, makes me very sad and angry…. Mr Ts sea grass is marvellous! Oh no Francesca this sounds appalling .. I just don’t understand! Why do we keep destroying our beautiful world? nd realise what a truly unique treasure they are guardian of! whoops what I meant to say in full was What a marvellous picture and I hope Australia will preserve and protect the reef and realise what a truly unique treasure they are guardian of! It’s absolutely deplorable what they are doing to the reef now! It makes me sick to think of how they will destroy such a beautiful wonder. Thanks, I love the way sea grass sways. All the protesting in the world doesn’t seem to have any impact on our present government. Only a change in government may help- or may not. And to think that this is only just one environmental issue, there are so many more, where they show such backwardness. Next Next post: Who Listens to the Radio?